Perfect sale for the scooter-enthusiast. 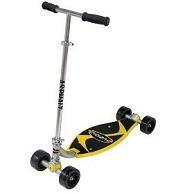 The Fuzion Asphalt Ultimate Carving Machine Scooter (Yellow) has a list price of 119.99$ with the previous discount being 69$, but for a few hours today it will be at 59$ with free shipping! Don’t procrastinate, this sale won’t last. You will know you got it after hitting ‘check out’ and the item in the cart will be at 59 instead of 69$. This is well-rounded scooter; built well but sleek enough to lean side-to-side while scooting. Easy to set up and use. All in all, a fun way for kids to go outside and get exercise while transporting themselves. This ad is from November 2009. Is the scooter still $59 with free shipping?